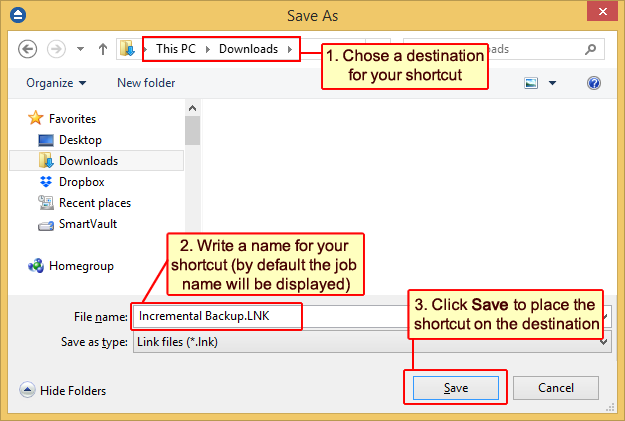 The Create Shortcut window can be opened from the File->Create Shortcut... menu item or by right-clicking the backup job from the backup list and selecting Create Shortcut... It creates a shortcut for the backup job on a designated location and you can simply run the backup job by double-clicking it. 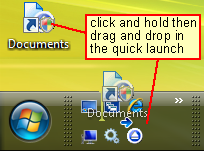 Once you have selected the Action to be performed and the backup job/group to run, press OK to create the shortcut. A window will prompt you to select a name for your shortcut and its destination. Once that's completed, the shortcut will be placed in the selected destination. Main application Option set by default. 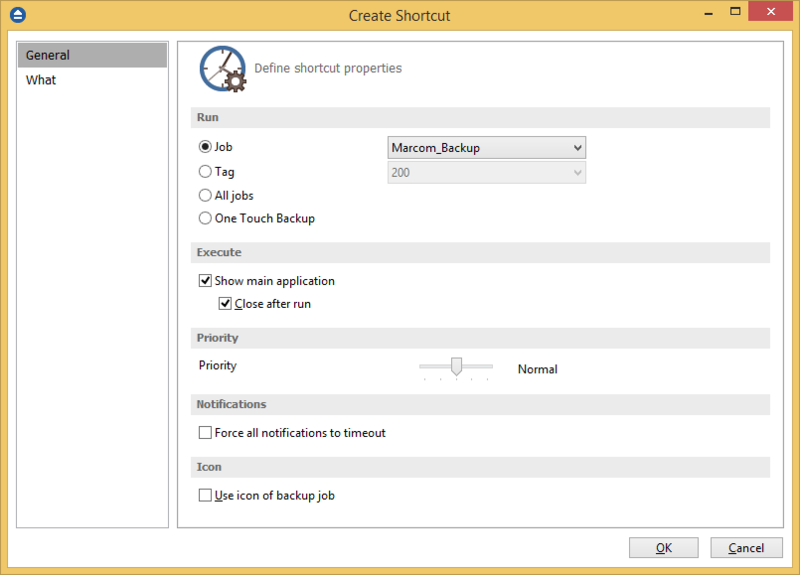 When you will double-click the backup shortcut, the main application will start and the backup will be executed. Furthermore, if the Close after run option is checked, Backup4all will be closed after the backup job is executed. Command line application Backup4all has also a command line version. If this option is selected, instead of the main application window a command line window will appear when the shortcut will be double-clicked. After the backup finishes the window is closed. If you want the backup to be executed in the background, you can check the Hide Window option. If this is checked, Backup4all will first delete the ".bkc" file and all zip files associated with the current backup job and after that execute the action. Test - you can create a shortcut to a test operation instead of a backup. When Test is selected, the Backup Numbers box is displayed 1,2,5,#,4. You can type in there the backup numbers you want to test. The order you type them in is the order they will be tested in. Use the * character to test all backup numbers, or the # character to test only the last backup. Clear the destination folder - deletes any files and folders inside the destination folder even if they are not related to the backup job. backup, load, test or cleanup. Just move the cursor to a lower or higher priority level. Use icon from backup job. If this option is checked, the shortcut placed on the desktop, quick launch or other location, will have the same icon as the one it has in the backup list. If unchecked, the default Backup4all icon will be displayed.